The data fields used to store client data can be customized to give you full control over the type of data that you need to capture for your clients whether you need standard fields such as first/last name, cellphone number, date of birth, address etc. or whether you need user defined fields that are specific to your business, like “Blood type” or “Nationality”, or anything you can think of. The first four fields, First name, Last name, Cell phone, Email Address are always on. The following three Address, Date of Birth, Gender are switched off by default, but you can switch these on here if you would like to gather this data for clients. 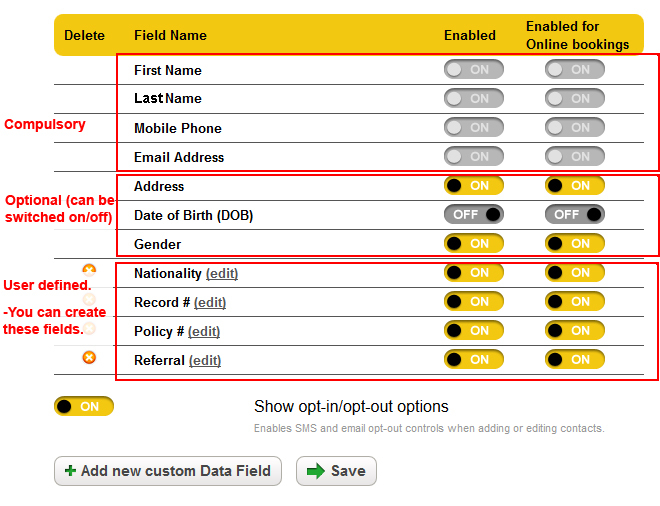 Below this are custom fields and you can create new fields to capture the data you need. There are two on/off switches for each field. The left one controls the data fields that you see when you are adding/viewing your client. The right side on/off switch controls the data fields your client will have to enter when they create an online booking with you on your website (if Online Bookings are enabled). 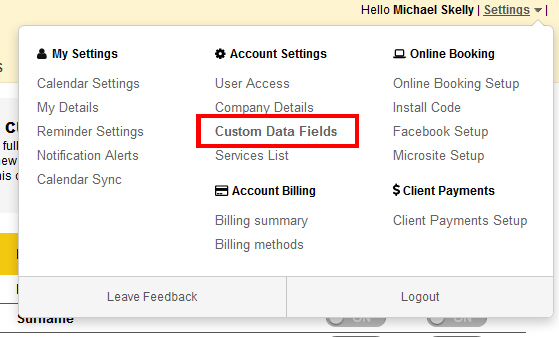 To create a new data field click the “Add New Custom Data Field” button. You can choose to make the new field a simple text field or a select box with preset option which can be picked. 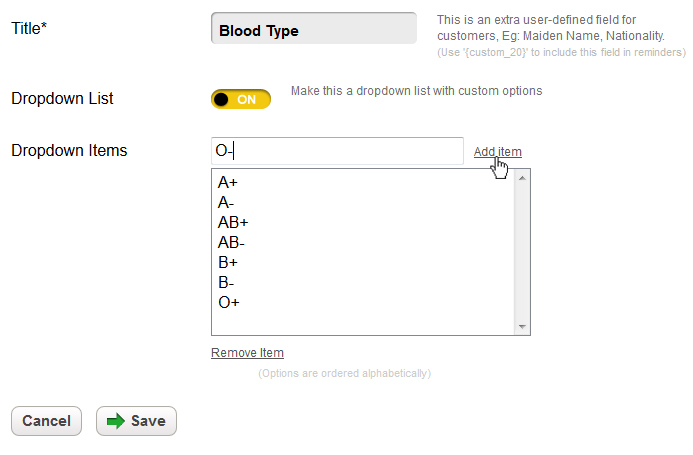 In this case we’ll look at creating a new sample field called “Blood Type” which has selectable options for each blood type. To set this field as a dropdown option change the “Dropdown List” option to “on”. Then you will need to individually add each of the selectable items that are possible. Don’t forget to click save when you have finished adding the items. When this is done if we click back into clients and view a client. 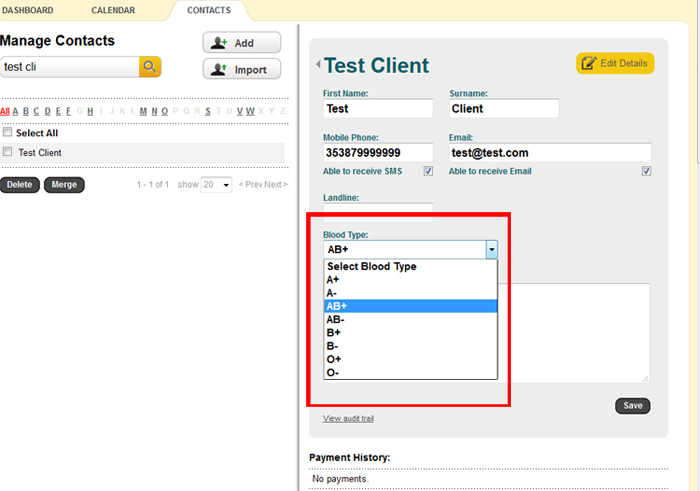 You will see the new data field for blood type. You will be able to select one of the added options and this data will be saved with the client. All client data including user defined fields are stored highly securely, encrypted with an AES-256 cypher More about Security.